The study, which was published Aug. 15 in the journal Nature Communications, focuses on the carbon released by thawing permafrost beneath thermokarst lakes. Such lakes develop when warming soil melts ground ice, causing the surface to collapse and form pools of water. Those pools accelerate permafrost thaw beneath the expanding lakes, providing food for microbes that produce the greenhouse gases carbon dioxide and methane. 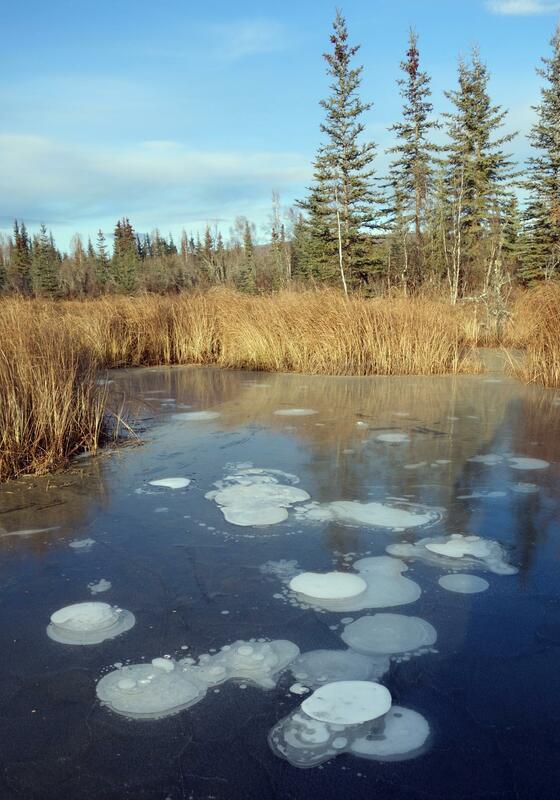 Lead author Katey Walter Anthony and her colleagues studied hundreds of thermokarst lakes in Alaska and Siberia during a 12-year period, measuring their growth and how much methane was bubbling to their surface. By combining field work results with remote-sensing data of lake changes during the past two years, they determined the "abrupt thaw" beneath such lakes is likely to release large amounts of permafrost carbon into the atmosphere this century. The lake activity could potentially double the release from terrestrial landscapes by the 2050s. The effort, conducted by a team of U.S. and German researchers, is part of a 10-year NASA-funded project to better understand climate change effects on the Arctic. Additional support by the National Science Foundation allowed scientists from UAF and the Alaska Division of Geological and Geophysical Surveys to collect data on permafrost location, thaw and associated greenhouse gas release from lakes in Interior Alaska's Goldstream Valley. The researchers found the release of greenhouse gases beneath thermokarst lakes is relatively rapid, with deep thawing taking place over the course of decades. Permafrost in terrestrial environments generally experiences shallow seasonal thawing over longer time spans. The release of that surface permafrost soil carbon is often offset by an increased growth in vegetation. "Thermokarst lakes provide a completely different scenario. When the lakes form, they flash-thaw these permafrost areas," said Walter Anthony, an associate professor with UAF's Water and Environmental Research Center. "Instead of centimeters of thaw, which is common for terrestrial environments, we've seen 15 meters of thaw beneath newly formed lakes in Goldstream Valley within the past 60 years." Emissions from thermokarst lakes aren't currently factored into global climate models because their small size makes individual lakes difficult to include. However, the study's authors show that these lakes are hotspots of permafrost carbon release. They argue that not including them in global climate models overlooks their feedback effect, which occurs when the release of greenhouse gases from permafrost increases warming. That feedback is significant because methane is about 30 times more potent than carbon dioxide as a heat-trapping gas. Existing models currently attribute about 20 percent of the permafrost carbon feedback this century to methane, with the rest due to carbon dioxide from terrestrial soils. By including thermokarst lakes, methane becomes the dominant driver, responsible for 70 to 80 percent of permafrost carbon-caused warming this century. Adding thermokarst methane to the models makes the feedback's effect similar to that of land-use change, which is the second-largest source of manmade warming. Unlike shallow, gradual thawing of terrestrial permafrost, the abrupt thaw beneath thermokarst lakes is irreversible this century. Even climate models that project only moderate warming this century will have to factor in their emissions, according to the study. "You can't stop the release of carbon from these lakes once they form," Walter Anthony said. "We cannot get around this source of warming."